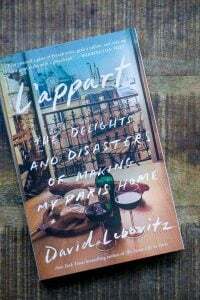 « Paris Booksigning – This Weekend! I just realized that I haven’t used the word “astonishing” in a while. I’m not jaded or anything. I still walk around the streets of Paris sometimes and think, “Wow, this place is pretty spectacular.” And on my travels, including a recent trip to Chicago, I was wowed by everything from terrific Mexican food to a wonderful bakery. But sometimes adjectives aren’t enough, and every so often you drop into a place and your jaw just kind of drops as well. Le Bonbon au Palais is such a place. 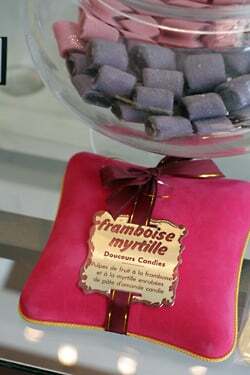 The owner of this boutique, Georges, has built a dedicated collection of candies from across France. On the wall to the right, when you walk in, are souvenirs of his enfance; candies that French kids would remember fondly, including “Bacon and Peas.” I was surprised to find Cacahuete de Morangis, peanut-dusted pralines. Peanuts? You don’t run across many candies with peanuts in them in France. One thing not in the kids aisle were Les crottes d’Isards. 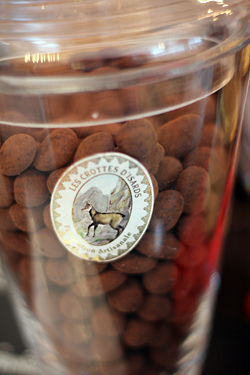 When I raised an eyebrow (if you remember, crottes are animal “droppings”, in French), he said they were a candy from Lourdes that were made by rolling together ground nuts, dipping them in chocolate, then rolling each one in cocoa powder so it resembles a small pellet. He offered me a taste and while the name didn’t exactly inspire me to chew it, I did. And I can say with complete honesty – they were the best crottes I’ve ever tasted. In the shop are at least fifty apothecary jars, each holding something sweet, curious, and wonderful. I poked around and found bonbons made with pine honey, Quernons d’Ardois (a favorite of mine made of crunchy, nutty nougatine, meant to resemble slate – ardois – paving stones). 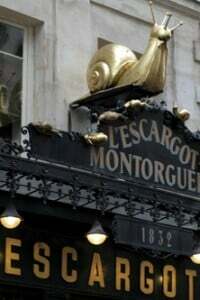 There was Le Négus, soft caramels cloaked in crispy caramel, marshmallows in a farandole of colors, with a large variety made with fish gelatin for those on certain diets. 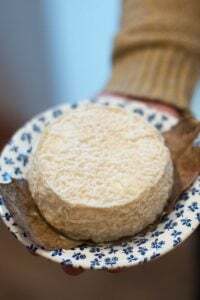 Les Tridents de Camargue were candies that had a trifecta of flavors and textures, which you discovered after you popped one in your mouth and started chewing it, making your way through the three layers. 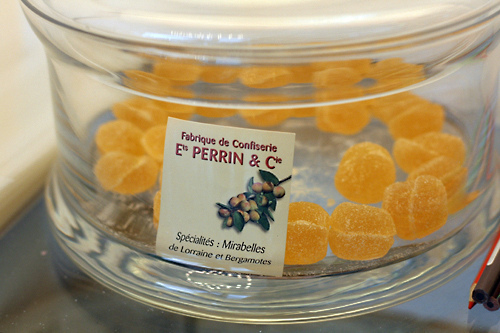 I expected to see plenty of candied fruits, but was surprised to see gorgeous whole candied citrons from Corsica, individually wrapper up like gifts. 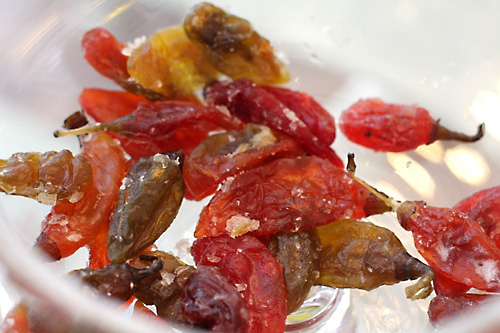 But the thing I was most curious about in the shop were the candied chili peppers from Guadaloupe. Georges told me that the process to make them was very long; they were cooked in fifteen different pots of sugar syrup, with three days of drying between each cooking. Since the French aren’t known as being big fans of spicy things, I inquired further and he told me that they were actually quite doux (sweet), but that when you bit into the little seeds as you chewed, they provided a slightly spicy afterbite. Recipe, please! Another curiosity that I loved were the Tommes de Chambéry. Resembling coin-sized wheels of tomme, a form of cheese, the tiny disks made of wild blueberry ganache enrobed in dark chocolate were undeniably cute stacked up in the jar. I wanted to stick my hand in and grab them all, but there were several signs requesting that patrons let Georges serve them. I am a sucker for anything gummy. If it’s jelled, I’ll eat it. Chuckles (not the black ones), Boston Fruit Slices (not the green or blue ones), and the monochromatic Orange Jells, for me were—and are, my downfall. (Don’t even get me started on marshmallows…) When I was in cooking school at Ecole Lenôtre, I took a week-long class in candy making and one day, my task was to cut up all the pâtes de fruits that we’d made into squares, using a guitar; a slicer with wires that allowed you to cut perfect squares from the larger blobs of fruit jelly that we’d made earlier. 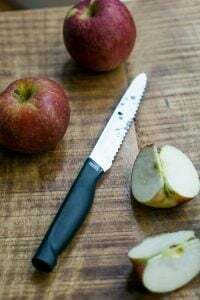 As I sliced and made perfect parallelograms, naturally, there were plenty of odd bits and ends, which I gobbled up like there was no tomorrow. However by the end of class, I was feeling a little queasy, and to this day, as much as I admire them in Parisian pastry shops, I rarely eat them anymore, proving there is too much of a good thing. However. 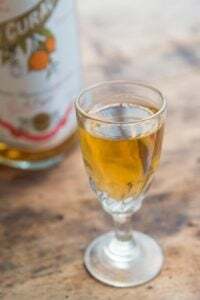 Jellies with bergamots? Count me in. I had him fill me up a big bag of these jellied buttons, mixing-and-matching to add a few other jellies from the Lorraine, which mixed bergamots with mirabelles, tiny yellow plums. With my little bags of candy in tow, I headed home and laid out my loot on the counter, like a kid arriving home from Halloween. (Although one who really scored that year.) So, yes, I was astonished as well as delighted to visit this shop. Open since 2009, Georges told me that 70% of his clients are French, and the rest from elsewhere. It’s nice to see that the French are such avid candy-eaters—in addition to one American amongst them. Love it all…especially the marshmallows…oh la la! It’s hard to be excited about candy while suffering post-Easter candy hangover but those I consumed aren’t exactly comparable to the ones described here. 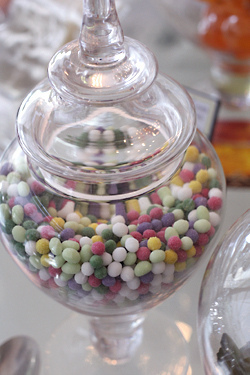 My lust for apothecary jars alone made this post drool-worthy but with delectable candy such as these in them? I’m in a little bit of heaven. If I ever doubted the possibility of being transported by words and pictures, my doubts have ended. I’m at Le Bonbon au Palais with you. 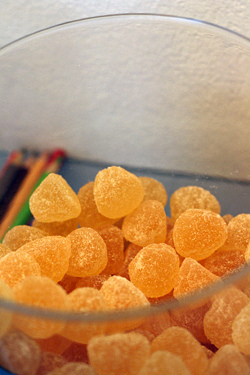 Only problem is that I want so badly to taste those candies flavored with bergamot. I remember that flavor so well from trips to France and it’s not easy to find in the US. Why or why can’t someone open up a store this this near me? 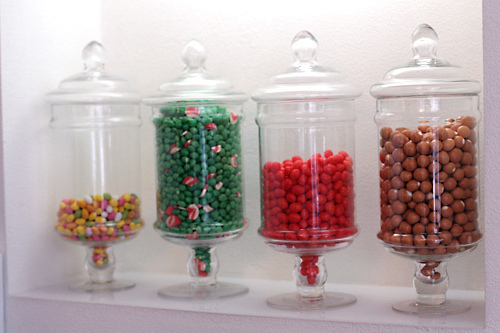 I LOVE apothecary jars, and have a little collection in my kitchen where I store my coffee capsules, sugars and candy. This store sound absolutely gorgeous! Yum! Glad you were allowed to take pictures there! They make me wish I had these candies in my Easter basket. Maybe next year. Well, my jaw has definitely dropped. I wonder if the bacon and peas is the French version of the peas and carrots candy I enjoyed when I was a kid. Well, sort of enjoyed. I didn’t much care for the tooth-crackingly hard minty peas, but loved the soft, sweet, chewy, cubed carrots. I haven’t seen those candies in at least 20 years, but now I will probably spend the entire afternoon pining for them. Ah well. I could not agree with you more that there *is* too much of a good thing. I once ate waaaaaay too many Twizzlers which was my favorite candy at the time and I am no longer tempted by those sweet red twists. I had a thought that maybe I should do that with all of the naughty things I tended to overindulge in but I have not gotten around to it yet. Unfortunately for me this post is a day to late… just got home (NYC) from Paris last night. 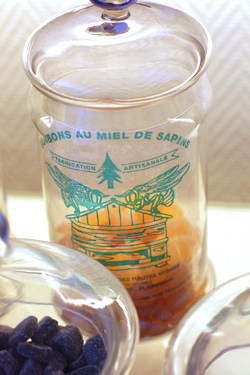 I will have to write down this address for a future trip… It is hard to find good quality jellies – pates de fruits. The mirabelles look amazing I love the way you captured the light shining through the jar. What a gorgeous store! This is definitely on our trip for June. I think I should be over my post-Easter chocolate melt down by then. The chilis are gorgeous! I’m going to have to try making some this summer. Ooh, nothing better than beautiful candy shops! It’s on my list! 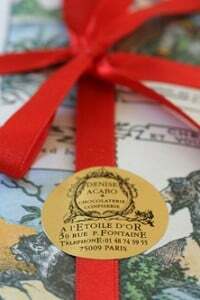 We went on a tour of Confiserie Florian in Nice a few years ago and loved it. I came home with clementines confits and candied rose and violet petals to decorate cakes with. So pretty! Everything looks so fun to sample!! Yum! This was such a sweet read (go ahead roll your eyes). You know, I’ve never had a desire to go to France until I started reading your blog. If that desire comes matures into something concrete, I will go to this shop and I will look for those jelly candies and I will be happy. Not as pretty, or organized, but there is a candy shop in NY that I always visit when I’m in the city. It’s called Economy Candy http://economycandy.com/ and it has a bunch of old school candies and a huge selection of Ritter Sports chocolates, a personal obsession. Wow so delicious looking! I would love to get my mom those candied chilies for mothers day. She loves hot food, although I think I will get her a huge box of chocolate to pay her back for the huge Easter egg she got me right before beach season. Damaris: I did go to Economy Candy on my last trip to New York and it is a lot of fun! Heather: He’s really nice, isn’t he? He gave me quite a few tastes when I went in there, and it was impossible to leave without a few bags once you get a sample. Laura: A lot of these candies are made in small places and they just don’t make enough to ship. And, of course, they need to be freshly rotated in a store to make sure the stock get changed constantly. Luckily there are some great candy shops and makers in a lot of other places, including in the US. But this one is, indeed, pretty special. What a lovely post! And so fun to read about all the fabulous candies… your pictures are truely amazing. This is definitely someone’s dream come true. I never eat the black Chuckles either…I wonder what that indicates? 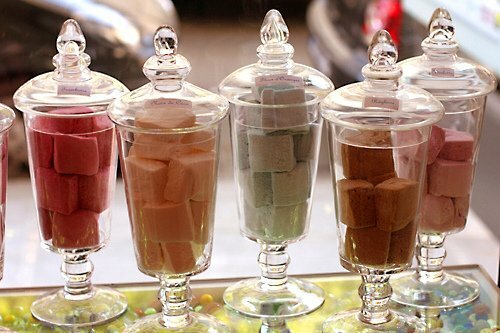 Is there anything more delightful in this world than rows of colourful sweets in pretty glass jars? We are hoping to make it to Paris in July and you can bet that I will make a point of visiting this place. Thanks! why is everything cuter in paris?! i still have a quiche wrapper from a quick streetcorner lunch. seventeen years ago. sheesh. The store is great, but I think I would most want to take Georges home. Is that possible? I didn’t even need to read this post because the photos are so gorgeous. This looks absolutely heavenly. I would be in heaven exploring all these exquisite sweets. Thank you for sharing. ah! les quernons d’ardoise d’Angers (Maine-et-Loire),recouverts de chocolat bleu, de la couleur des ardoises exploitées à Trélazé,tout à côté… Quelle introduction à la découverte des Châteaux de la Loire ! I love candy shops and that one looks so much more sophisticated than the ones in the mall in the U.S. But, I still wander into the candy emporiums in the mall. In fact, when I was in Arizona last month, I went into one that had some retro candy. They had Banana flavored Bonomo Turkish Taffy (I liked the vanilla better) and Coconut Bars. Do you remember those? 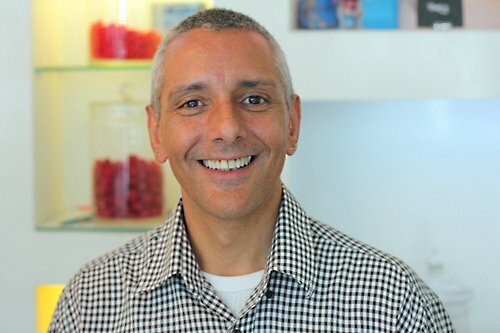 A flat, 1/4″thick, chewy bar of coconut in pink,white and brown stripes as a single bar? I was in heaven. I haven’t had one of those since I was a kid…and I wasn’t born yesterday. Well, not physically, anyway. They even had Chuckles, which I also bought (the jelly candy is my favorite, too) except, I save the black ones for last so it doesn’t overpower the other flavors, but I do like the black ones, too. They also had Bit O’Honey’s. Can’t eat those anymore, but I loved them back in the day! I’d better show this to my hubby. We’ve got loads of chillies growing. We started off with a couple of small plants and they have really taken off, they’re decent sized bushes now! He started growing them to make his own curry but there are now so many we supply the neighbours! Totally salivating. Candy with a spicey aftertaste? How un-french! Delightful! btw: I’m still traveling around Switzerland with my jaw dropped and it’s just the landscape… I know the feeling of speechless astonsihment. I still feel that way every time I go to Paris. I suppose if I lived there my mouth would never shut. Not something Mr. Wild Dingo would relish! 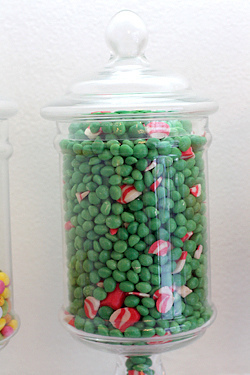 Nothing brings out the kid in us like candy in a jar, right? Even better that we can’t reach in, but must ask an adult to serve us. This post sums up Paris for me. Take something simple – produce it perfectly – then display it artistically. And of course in the case of food – have it taste like heaven! Thanks for taking us with you. Mon bonbon prefere LE NEGUS dans ma region prefeee Le Nivernais…. It’s been years since I’ve been to Paris, and your blog makes me miss it so much. This post was incredible, it looks like such a magical, special little shop. I wouldn’t know where to start because everything looks so tasty! I love good candy – this shop is beautiful on the eyes! I’m in the middle of making carrot marshmallows so that first photo really caught my eye. I love the colors and the possibilities. Ok, this is definitely on my short list while in Paris! My sister ( candy fanatic) took me to Economy Candy on my last trip to NY to see her. She and I waxed nostalgic the entire time while gorging on sweets long forgotten. This candy store looks like something out of a dream…too pretty ( due to gorgeous photos ) and flavors not yet tried but yearning to. Can’t wait! I must visit this shop and I will! I’m reading your book and I visit your site when I get a blog update, does that qualify as stalking? David, I must tell you that amongst the hectic daily world we all live in, when I receive your blog post in my in box, I am able to escape for just a bit and imagine myself in Paris. I absolutely adored your book, The Sweet Life in Paris. I had just received your post about the paperback version, when I was in Carmel, CA and a little book shop and low and behold, the very first book I saw on the rack was your gem. Will be in Paris in October!! David…I aspire so much to living your life! Thank you for all the beautiful and sweet posts like this one that make me drool and dream of my future life in France. Candy with such interesting flavors must be amazing. I wish such candy shops were abundant in America. I still haven’t made the pilgrimage to Economy Candy, which I had sworn I would after your post last year, though I think I would much rather be visiting your Bonbon au Palais, which looks so much chicer. Amen to the Chuckles, whose mention brought back Halloween loot memories. I love gummies too and got sick on Sunday eating one too many Sour Patch Jelly Bean. Does he do any flower based sweet, eg, violet? I would be enraptures if he does! That short film is wonderful – though I wasn’t expecting the mournful Michael Shenker-esque soundtrack! What a lovely, jewel-like store. Thanks yet again for sharing, David! This post reminded me of Roald Dahl’s books and the way they perfectly capture a child’s obsession with candy. Perhaps it’s the mad-scientist aspect of the apothecary jars? This is a store for all those candy-mad children, all grown up – sophisticated and beautiful. Ooooo… everything looks so pretty! I must drop by when I’m in Paris in June. What gorgeous photo’s of these beautifully interesting candies. They all look far more interesting than the wrapped commercial kind available in our stores. And the marshmallows – I wouldn’t be able to resist them. oh how i drool! French candies seem so much more elegant and higher quality than the manufactured candy bars in America. Someday, I must visit Paris simply for the sweets…. Beautiful! I love the apothecary jars! Economy Candy could not be on par with this place, because Economy Candy is devoted to the popular, “penny candies” when Americans loved when we were kids, rather than the artisanal treats described here. When describing Economy Candy’s hand made stuff, like the dried fruit or nuts dipped in chocolate (which they CERTAINLY don’t make, themselves), what would be the right word to use? Hmmm…. “rubbish”? Yeah, that’s it. oh what a lovely place. so typiquement french. so but i have to ask the question, do you think it’s the bon bon au palais because it’s next to a palace or does it mean a bon bon on the roof of your mouth because i think that is also the word for palate? love the rue monge. thx! Love the packaging, nicely presented. 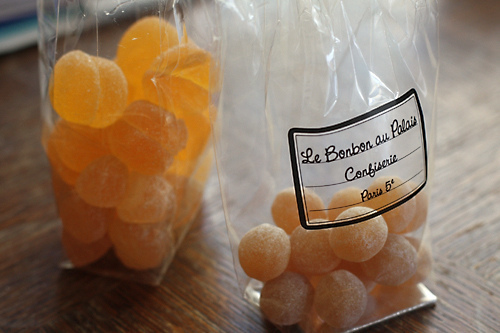 mileparadis: Because the owner keeps a “school” theme going around the store (there’s pencil and ruled writing books lying around) – “le bombon au palet” gets changes to “bonbon au palais” or “the candy of the palace” so to speak..
::SHOCK:: You eat Chuckles?! And those jelled orange wedges? These pictures were amazing! And you have a wonderful way with words as well as with the camera. Brilliant post, thank you.I particularly like the idea of the candied chilli and really want to try one now! I’ve been obsessing over those candied chili peppers. Normally, I’d start with the fresh fruit for something like this, but when I look at the photo I have to wonder if they were dried before candying? Or were they just peppers with very thin flesh? Could you tell? wonderful wonderful! they make the quernons d’ardoise where i live in angers! delicious, but outrageously expensive. This shop looks incredible, stocked with so many beautiful things I’m curious to try. Oh WOW! This is just the shop I needed and absolutely don’t need! 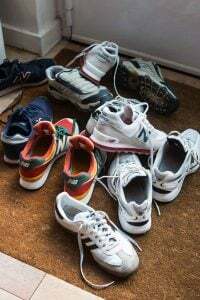 Thanks and, um, bye – off to the gym in anticipation!! Beautiful post! It made me resolve to make chocolate truffles, they are so good at our favorite KC restaurant, Le Fou Frog. I looked up the recipe in ‘The Perfect Scoop’. I used chambord as the liqueur and melted a few ozs of chocolate. 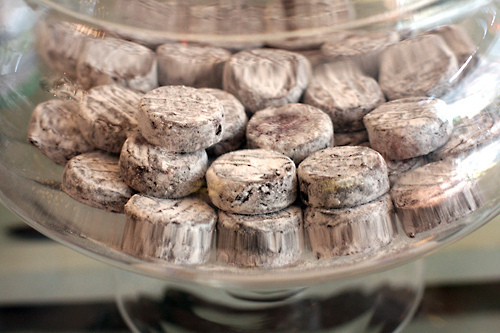 I rolled the chilled truffles in a thin layer of chocolate and dusted with Valhrona cocoa and chilled again. Absolute heaven! A thin snap of chocolate crust, and the slightly bitter cocoa. 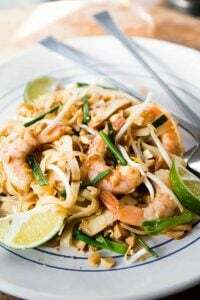 Insanely good – your recipes never disappoint. How wonderfully enticing … all your photos and those guimauves are astonishing ! It was amusing reading as well, and I share your love for chewy stuff – right now it’s in the form of loukoums. Must stop by this shop soon ! 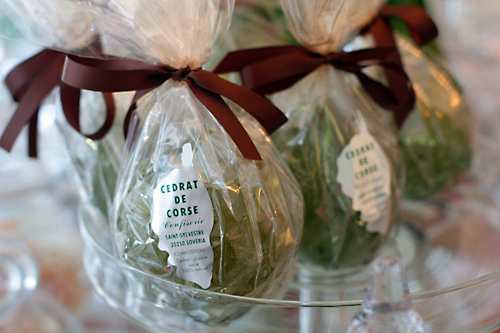 You also might be familiar with the confiserie on Rue Brea specializing in regional goodies as well. Wow, the photos are making my mouth water and lips pucker! Usually I don’t eat candy (because my dentist has a way of getting in my head and whispering about all the damage those ‘boiled sweets’ will do to my teeth), however, I can easily imagine throwing caution to the wind and buying too much candy in this shop. Especially that soft caramel within hard caramel, sounds delicious. I keep going to see Georges, ever since I read this. He said lots of people have come in because of the article. I am addicted to the guimauves! I ate so many yesterday that I almost wanted to throw up. It was awesome. I have been reading your blog right up to before my recent trip to Paris. 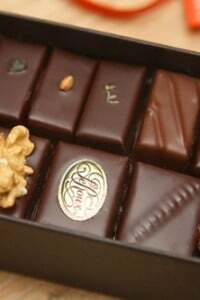 Le Bonbon au Palais was one of my first stops. When I asked the owner if he had Malabar chewing gum he screwed his face up in disgust. “We don’t carry items full of chemicals!” It was a chewing gum I grew up with while visiting France as a child, and it brought back fond memories – especially its ability to really stick good in my brother’s hair. I apologized for my transgression and went about shopping in the store. The Pimantes de Guadeloupe were a hit back at my uncle and aunt’s that night. Thanks for what you do for people living in and visiting this wonderful city that I never grow tired of. For my first visit to Paris I made certain to include Le Bonbon au Palais on the must-visit list-just now returned and all my treasures are spread out on the little hotel bed–what a wonderful place! Georges was delightful-patient, slipping different tastes to me as we toured his store. 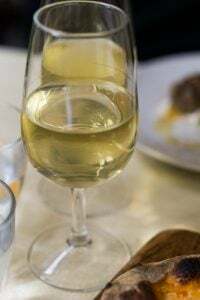 Especially enjoyed the candied violets, roses and leafy green savory-sweet–I think called verite, something like that? Anyway, thanks for the hint, David. I mentioned your blog to Georges and he said how much you like his store, I sure can see why!